Tower Chiropractic and Massage is excited to offer Infrared Heat Therapy in our Downtown Calgary Practice. Infrared Heat Therapy delivers heat to areas where patients are experiencing pain and discomfort. Infrared Heat Therapy increases circulation, reduces inflammation and promotes the body’s natural ability to heal itself. Infrared heat promotes the release of nitric oxide — a short-lived gas that is important for the health of your arteries. The release of nitric oxide that takes place when Infrared Therapy is used in areas where you are feeling pain increase blood flow, thus reducing pain and inflammation. Infrared Heat Therapy is a very simple and painless treatment. 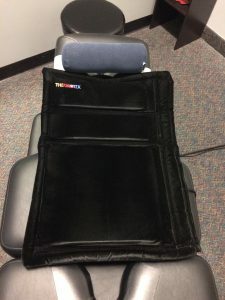 At Tower Chiropractic and Massage, we use flexible pads that contain multiple infrared heating pannels. These pads are then placed directly over the area where you are experiencing pain. The energy from the infrared heat then penetrates deep beneath your skin and is absorbed by the tissues. In as little as 30 minutes, your blood flow is enhanced, creating a boost in circulation, which lasts for several hours immediately after the pads are removed. To learn more about this service and how it can help you, contact our Downtown Calgary Chiropractic and Massage clinic today! Call us at (403) 263-7477 to request your Downtown Calgary Infrared Therapy appointment today!